Did you know that the 1611 AKJV, or Authorized King James Version, was not the very first English version of the Bible, but that there were several English translations before it? Allow me to share the story with you. I think that you will find it to be rather interesting. According to historical documents, the honor of producing the first English Bible belongs to a man by the name of John Wycliffe -- also spelled Wycliff -- who was a noted fourteenth century theologian and world renowned philosopher from Oxford University. Some people credit Wycliffe with being the very first of the English Reformers, due to his strong opposition to the established religious order of his day; that is, the Roman Catholic Church. "Not given to wine, no striker, not greedy of filthy lucre; but patient, not a brawler, not covetous; . . . Likewise must the deacons be grave, not doubletongued, not given to much wine, not greedy of filthy lucre;"
"For a bishop must be blameless, as the steward of God; not selfwilled, not soon angry, not given to wine, no striker, not given to filthy lucre; . . . Whose mouths must be stopped, who subvert whole houses, teaching things which they ought not, for filthy lucre's sake." "Feed the flock of God which is among you, taking the oversight thereof, not by constraint, but willingly; not for filthy lucre, but of a ready mind;"
During the early 1380's, which were the final years of his life, John Wycliffe received his greatest revelation: The most effective way to fight against the lies of the "Holy Mother Church", was simply by placing the Holy Scriptures into the hands of the common man, so that he could read them for himself. 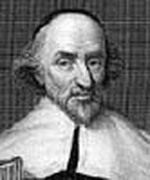 Thus, while Wycliffe's opposition to the Roman Catholic Church cost him his prestigious position at Oxford University, and shook up the Roman Catholic world to its very foundations, he and his team of dedicated colleagues -- who became known as the "Lollards" -- became the first ones to distribute hand-written manuscripts of the complete Bible in the English language. His translation was based upon the fourth century Latin Vulgate, which was the common language of the people of the Roman Empire. From what I have read, the Greek and Hebrew texts of the Old and New Testaments were not available to Wycliffe; thus he chose to use the Latin Vulgate as his source. While John Wycliffe died a natural death, according to a biographical video I possess entitled "John Wycliffe: The Morning Star", the pope was extremely enraged by Wycliffe's teachings. Thus, forty-four years after this brave pioneer's death, the pope ordered that Wycliffe's bones be unearthed, crushed, and then dispersed in a nearby stream. Such was the cold hatred of the Roman Catholic hierarchy towards anyone who dared to question their authority or corrupt doctrines. The fact that a Roman Catholic Church leader would even go so far, and stoop so low, as to desecrate a man's grave, in order to seek revenge, almost defies one's imagination. Yet sadly, this hatred would only continue to grow, and would become even more violent, in the years to come, as you shall see shortly. According to the historical record, another one hundred and fifty years passed before the New Testament became available in English, on a large scale, to the people of Great Britain. This was due in large part to the dedicated work of another brave pioneer: William Tyndale. Like Wycliffe before him, he too was a Catholic who abandoned his religion upon realizing the depth of its corruption. Tyndale was an extremely gifted man. He was fluent in eight languages; and was a key driving force behind our modern English language. The famed English playwright, William Shakespeare, followed in Tyndale's foot- steps several decades later. Similar to Wycliffe, Tyndale's lifelong desire was to see the Scriptures made available in simple English to the common man; in this particular case, the Greek New Testament. 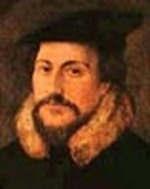 Tyndale was able to fulfill his dream as a result of the work of Dutch scholar and theologian Dessiderius Erasmus. In 1516, with the help of printer and fellow Reformer, John Froben, Erasmus published the very first non-Latin Vulgate text of the Bible. You see, for many centuries, Latin had been the language of the educated class; while the simple people, who were obviously in the majority, remained in both scholastic ignorance and spiritual darkness. Erasmus' Latin was not the Vulgate translation which had been done by Jerome during the late third and early fourth centuries. Instead, it was the result of his own Greek New Testament, which he had compiled from six or seven partial New Testament manuscripts, which were available to him at the time. Erasmus' translation has become known as the "Textus Receptus", or Received Text; and as you will see shortly, it is upon this ancient text that the AKJV is based. Surely, Peter, who the Roman Catholic Church claims they succeed, would truly grieve if he could see the sad state of the Lord's Church today! In 1517, Luther basically declared war on the church when he nailed his 95 Theses of Contention to the door of the Castle Church in Wittenberg. Among other things, he denied that the pope -- Leo X -- had the authority to forgive sins. It was this act of joining his voice to those of William Tyndale and John Calvin, and daring to proclaim the doctrine of Salvation by Grace alone, and not by dependence upon the Roman Catholic Church, which raised Rome's ire the most. A Papal Bull was issued against Luther in 1520 in which the ex-monk was given sixty days to recant his "heretical" beliefs, but Luther defiantly burned the document, along with a number of other papal books and papers, in front of an audience of doctors, students and local citizens. In the months following the Diet of Worms in 1521, which had been convened by Emperor Charles V for the express purpose of finding Luther guilty of heresy -- being as the RCC knew that Luther would never recant his new-found beliefs -- Luther was excommunicated and forced into exile. It was during that time while hiding at the fortress Wartburg, and assuming the false identity of "Junker Jörg" -- or Knight George -- that Luther translated the New Testament into German from Erasmus' Greek and Latin New Testament. He published it in September, 1522. Twelve years later, in August, 1534, Luther completed the first edition of his complete German Bible, which is known as the Wittenberg Bible. Luther died at the age of sixty-three during the early morning hours of February 18, 1546, as the result of a combination of infirmities which had plagued him for many years. He was buried under the pulpit in the Castle Church of Wittenberg. Luther's work was carried on in large part by his friend and fellow Reformer, Philip Melanchthon. Returning to William Tyndale; with the Textus Receptus in hand, and in spite of the threats of inquisitors and bounty hunters alike, working along side of Martin Luther in the German towns of Cologne and Worms, Tyndale succeeded in printing the first English New Testament in 1525-26. One historical commentary states that Tyndale's New Testament contained some of the very same marginal notes as Luther's German New Testament, which reveals what influence Luther must have had on Tyndale. Please notice that whereas the work which had been performed by Wycliffe and his colleagues was all hand-written, and thus probably reached a smaller body of people, and at a slower pace as well, Tyndale's work was the first printed version of the New Testament; and that is why it has reached a much wider audience from that time until now. "Behold, the days come, saith the Lord GOD, that I will send a famine in the land, not a famine of bread, nor a thirst for water, but of hearing the words of the LORD: And they shall wander from sea to sea, and from the north even to the east, they shall run to and fro to seek the word of the LORD, and shall not find it. In that day shall the fair virgins and young men faint for thirst." "But now hath he obtained a more excellent ministry, by how much also he is the mediator of a better covenant, which was established upon better promises." "And for this cause he is the mediator of the new testament, that by means of death, for the redemption of the transgressions that were under the first testament, they which are called might receive the promise of eternal inheritance." Now, if you still do not quite understand why it is that the Roman Catholic Church had such animosity towards the work of William Tyndale, and those who had come before him, allow me to explain it in the simplest way that I can. Sadly, in this sinful world of ours, there is a basic law of life which states that if I possess something which you want or need, then I have power over you. That is an easy concept to understand, isn't it? In this particular case, the common people were taught, and rightly so, that they were sinners, and doomed to damnation. But, where the demonic error was introduced, is in that while they were told that there was a solution to their problem; while they were told that there was a way to achieve forgiveness, and a way to avoid the fire of hell, they weren't shown the right solution; instead, they were shown the wrong one; and they were pointed to the Roman Catholic Church, with its multitude of stiff laws and special requirements which had to be observed, in order for one to obtain Salvation. In other words, through a combination of fear and deceptive doctrines, the Church of Rome absolutely gained power over the masses, because the people wanted forgiveness, and they wanted Salvation; and the RCC was more than happy to offer it to them . . . for a price! ". . . Verily, verily, I say unto you, I am the door of the sheep. All that ever came before me are thieves and robbers: but the sheep did not hear them. I am the door: by me if any man enter in, he shall be saved, and shall go in and out, and find pasture." The truth cannot be more plain than that. Jesus is the Way, the Truth, the Life and the Door to Salvation, the Door to Heaven. He is the only Door; there are no others. So what did the Roman Catholic Church do? In their craftiness -- and I must admit that it has been very subtle -- they didn't just do away with the Door -- meaning Jesus -- as their sin would have been too obvious; but what they did decide to do, was to place a screendoor in front of the Door. The Real Door is still there; however, in order to get to it, you have to go through the screendoor first. Exactly what is the purpose of a screendoor? Basically, it is meant to act as a filter. On hot days, you can open the main door in order to allow the fresh breeze blow through your home, while still keeping the bugs out by means of the screendoor. ". . . Follow me, and I will make you fishers of men." So we are clearly told by the Lord that we have been called to be fishermen, whose job it is to catch fish, or people, in the Net of God's Kingdom. The Roman Catholic Church has decided that instead of doing that, they only want to draw people into their own Earthly kingdom of power and wealth; so they set up a double-door, double-net system. They put a false door -- meaning the pope -- in front of the Real Door -- meaning Jesus -- and they put a phony net -- their worldly system of power, wealth and glitzy cathedrals and churches -- in front of the Real Net -- God's Eternal Kingdom. As I point out in the series "Gargoyles: Satan Loves Church Buildings! ", during the era of the Byzantine Empire, when Emperor Constantine and his successors ruled from the city of Constantinople, the "Holy Mother Church" was not only convinced, but in fact taught, that the Christian world was already enjoying the Millennial Rule of Christ on Earth, via the church, which had its many beautiful and richly decorated cathedrals and churches spread across the empire. This was a commonly accepted view at the time, which you can research for yourself on the web. Whether or not they have forsaken such a heretical view I honestly do not know. To continue then, as we have seen, God has called us to be fishers of men, right? As the Lord's fishermen, we use the Word as a lure to draw people into the Net of God's Kingdom. On the other hand, the Roman Catholic Church uses its false doctrines, laws and traditions, and outward beauty to draw people into its Earthly, false, self-enriching kingdom. Let us return to the screendoor analogy for a moment. There is an interesting thing about screendoors. As you approach a screendoor, depending on how clean or dirty it is, you may be able to see the real door on the inside, but, you must still pass through the screendoor, in order to get to the real door. In a similar fashion, when people become members of the Roman Catholic Church, they may be allowed to catch glimpses of the Real Door, and the Kingdom within, but they aren't allowed to get past the screendoor. Why does this happen? Quite simply, it is because they don't realize that the false door they have entered is actually a trap door; in fact, it is a revolving door. They just keep going around and around, caught up in the Church of Rome's false doctrines, laws and traditions, sacraments and special requirements, so that some of them, and perhaps even most of them, never make it to their final destination; they never make it through the Real Door and into God's Kingdom! When you get caught in a real revolving door, such as at a huge department store, isn't that what sometimes happens? You know where the store entrance is, and you can observe the interior of the store each time that the revolving door spins around, but as long as someone behind you is pushing the revolving door, you can't get out. You are caught in a vicious cycle. Other false religions operate in exactly the same manner, such as some of the oriental religions which promote the big lie of reincarnation. Those poor people are caught in the very same kind of vicious cycle. They want to make it to Nirvana, but they simply aren't good enough yet. So whether it is Roman Catholicism, or eastern religions, or some other deceptive false cult, they all basically operate in the same way. They thrive by preying upon people's hope and belief that someday, perhaps after they've been through enough reincarnations, or perhaps after they have paid the church enough indulgences, or perhaps after they have done enough good works, or perhaps after they have said enough rosaries, or perhaps after they have made enough trips to the cathedral on bloodied knees, they will finally make it into their chosen paradise. "But woe unto you, scribes and Pharisees, hypocrites! for ye shut up the kingdom of heaven against men: for ye neither go in yourselves, neither suffer ye them that are entering to go in." So they are caught in a revolving door! Isn't that really amazing?! Isn't that just powerful?! Now can you understand why sometimes I just sit here and go "Wow, Lord, that is really heavy!" I know that this is not me; it is only Him. I couldn't possibly make these Biblical connections on my own. Sometimes I even have to get up out of my chair and walk around my room a bit, because I am just so excited by these things. God's Spirit is just that heavy! What is so interesting about everything I have just shared with you, is that it directly links to the distant past. You see, the Scribes and the Pharisees did the very same thing! As I point out in other articles, their screendoor, their false net, was the Mosaic Law and all of the interpretations and traditions which they attached to it; which they used, as Jesus said in the previous verses, to prevent the common people from entering the Kingdom of God; just like the Roman Catholic Church with its sacraments, and strict rules, and indulgences, and all of the other nonsense which they have created during the past sixteen hundred years or so. ". . . If ye continue in my word, then are ye my disciples indeed; And ye shall know the truth, and the truth shall make you free . . . If the Son therefore shall make you free, ye shall be free indeed." "The Spirit of the Lord is upon me, because he hath anointed me to preach the gospel to the poor; he hath sent me to heal the brokenhearted, to preach deliverance to the captives, and recovering of sight to the blind, to set at liberty them that are bruised,"
Sadly, as I noted a moment ago, despite the fact that the true Gospel of Jesus Christ has been preached for literally hundreds of years now, the worldwide Roman Catholic Empire continues to have a smothering grip on millions of people to this very day. Given the dangerous spirit of compromise and ecumenism which has infected many of the Protestant churches, I sense that things may get even worse, as the RCC gradually achieves its goal of bringing all of the "stray" churches back into its smothering embrace! The campaign of hatred against Tyndale was very effective. Only two complete copies of the first printing of his New Testament are known to have survived the wrath of the Roman Catholic hierarchy. Pre-1570 editions are both rare, and valuable; particularly pre-1540 editions and fragments. As a result of the persecution he suffered at the hands of the Roman inquisitors, William Tyndale was unable to finish his translation of the Old Testament, which would have enabled him to publish a complete English Bible. After eleven years of being hunted by his enemies, Tyndale was finally caught; betrayed by an Englishman whom he had befriended. He was forced to endure five hundred days of incarceration, before he was publicly strangled, and burned at the stake, in 1536. According to historical records, his last words were, "Lord, open the eyes of the King of England". Between the release of William Tyndale's New Testament, and the appearance of the 1611 Authorized King James Version of the Bible, a number of inspiring, and yet sad things, were happening in Great Britain. Prior to, as well as following Tyndale's martyrdom, religious freedom in England continued to wax and wane. 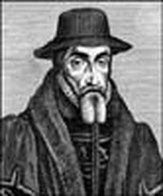 During this time, Myles Coverdale, a loyal assistant to Tyndale during the last six years of his life, and fellow Reformer, John Rogers, carried forward the work which had been initiated by Tyndale. Coverdale completed translating the Old Testament, and on October 4, 1535, he printed the first complete Bible in the English language. He made use of Luther's German text, and the Latin text, as sources. This Bible is referred to as the Coverdale Bible. Following the publication of the Coverdale Bible, John Rogers went on to print the second complete English Bible two years later in 1537. Rogers printed this second edition under the pseudonym of Thomas Matthew, being as a large part of his work embraced the outlawed 1534-35 edition of William Tyndale's Pentateuch -- the five books of Moses -- as well as Tyndale's New Testament, plus Coverdale's Bible, as well as a small amount of Roger's own translation of the text. For this reason, this version of the Bible is commonly known as the Matthew's Bible. This was not the end of these two men's contributions to our English Bible. In 1539, under the orders of King Henry VIII, Thomas Crammer, who was then the Archbishop of Canterbury, hired Myles Coverdale to publish yet another Bible. This new edition was referred to as the Great Bible, due to the fact that it was over fourteen inches high. 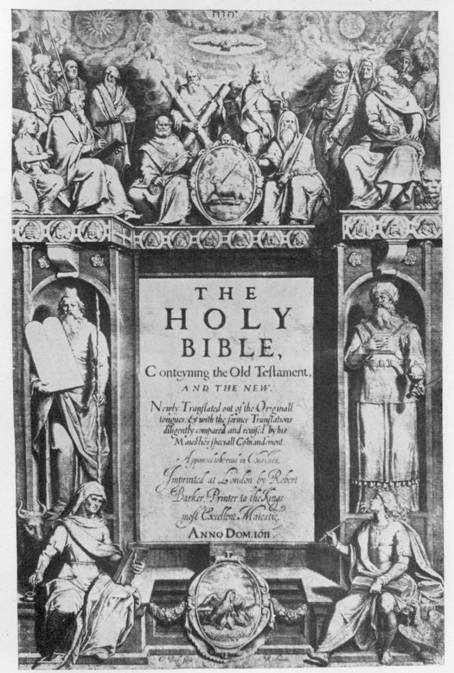 Unlike Coverdale's original version, the Great Bible became the first official English Bible authorized for public use. By King Henry's decree, it was distributed to every church, and chained to the pulpit; and a reader was provided so that the poor and illiterate could hear the Word of God in their own tongue; in effect fulfilling the very dream of William Tyndale, who had been martyred three years earlier. Seven editions of the Great Bible were printed between April of 1539 and December of 1541. As we continue this article in part two, you will discover that the tide would soon turn against the brave Reformers of the early sixteenth century. Yet in spite of the evil which was to come, you will also see how God's Spirit was moving in a great way all across the European continent. I trust that you will join me. Please go to part two below for the continuation of this series. Following this busy period of productivity by the Reformers, as is usually the case when God's Word is widely proclaimed, -- please refer to the Book of Acts -- a new threat arose. As the cry for reform within the extremely conservative, powerful and corrupt Roman Catholic Church grew stronger, it was only a matter of time before the "Holy Mother Church" would react; and she did. William Tyndale was but one of the first Reformers to die a cruel agonizing death at the hands of the blood-drenched Roman Catholic inquisitors. 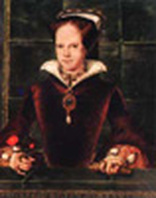 In the year 1553, Mary Tudor, the eldest child of King Henry VIII, and the only surviving child of his first marriage to Katherine of Aragon, arose to the English throne. Being a staunch Roman Catholic, she posed a serious obstacle to the publication of an English version of the Bible. This woman seemed to be possessed by a demon in her quest to return England to the fold of the Roman Catholic Church. 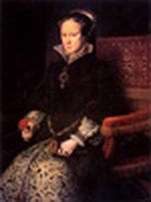 In 1555, this English Queen Jezebel -- who would become known as "Bloody Mary" -- ordered John Rogers and Thomas Crammer to be burned at the stake. However, Queen Mary's iniquity, and her lust for blood, did not stop there. In all, she killed almost three hundred so-called "heretics", because of their "crime" of just being Protestants. This dark era resulted in the Marian Exile, and the Reformers fled from their beloved England, with little hope of ever seeing their homeland again. Apparently, by God's Design, some of these brave men regrouped in Geneva, which was one of the few safe havens for them in Europe. There, they were received with sympathy by the blossoming Protestant church. This band of Christian refugees was led by Myles Coverdale, John Foxe -- author of "Fox's Book Of Martyrs" -- also known as "Book of Acts and Monuments" -- Thomas Sampson, and William Whittingham. What amazed me as I began to conduct my research for this current series, is the realization that all across Europe, from England, to the Netherlands, to France to Germany, to Switzerland, God's Spirit was moving, and He was raising up an army of willing soldiers, who would challenge the corrupt beast that was the Roman Catholic Church. God heard the cry of the poor and the illiterate, and He responded in a great and mighty way, which would affect the world for centuries to come; in fact, to our present day. Under the protection of Frenchman John Calvin and Scotsman John Knox, who were also important figures in the Reform movement, the Church of Geneva decided to produce a Bible which they could use to educate their families while they continued in exile. The New Testament was completed in 1557, and the complete Bible was first published in 1560. Known as the Geneva Bible, it was the first Bible which incorporated verse numbers in each of the chapters. Every chapter was also accompanied by extensive marginal notes and references so thorough and complete, that the Geneva Bible has come to be regarded by some scholars as the very first English study Bible. For over one hundred years, the Geneva Bible was the Bible of preference amongst English-speaking Christians; so much so, that renowned playwright, William Shakespeare, extracted many quotes from it. Between 1560 and 1644, at least one hundred and forty-four editions of the Geneva Bible were published. 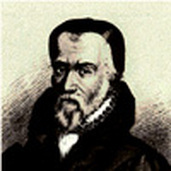 Close examination of the 1611 Authorized King James Version demonstrates the influence of the Geneva Bible, and thus the influence of William Tyndale, because the Geneva Bible retains approximately ninety per cent of Tyndale's translation. It may surprise you to know that for many decades, the Geneva Bible remained even more popular than the Authorized King James Version. Not only that, but it holds the honor of being the very first Bible which the Puritans and the Pilgrims brought to America. As a side note, due to a verse in the Book of Genesis which describes the clothing which God made for Adam and Eve upon expulsion from the Garden of Eden as "Breeches" -- which is an Old World form of the word "Britches" -- some people have referred to the Geneva Bible as the Breeches Bible. With the end of Queen Mary's reign in 1558, the Reformers were finally able to safely return to England. The Anglican Church -- or Church of England -- under Queen Elizabeth I, reluctantly tolerated the printing and distribution of the Geneva Bible; however, the marginal notes, which were very critical of the Roman Catholic Church -- even comparing it to Babylon the Great in the Book of Revelation, and accusing the pope of being the Antichrist -- were not viewed with favor by those in authority. The solution was simple: a new version without all of the inflammatory remarks added by the Reformers, must be produced. Thus, in 1568, the Bishop's Bible was introduced. Even though the government backed this version, and despite the fact that nineteen printings were made between 1568 and 1606, this compromised edition never gained popularity amongst the people; the reason being that the Geneva Bible was simply too trusted to compete with. With the death of Queen Elizabeth I in 1603, James Stuart, who was then Prince James VI of Scotland, became King James I of England. One year later, in 1604, the Protestant clergy approached the king, and requested that a new translation be made to replace the Bishop's Bible, which, as I have already stated, was not faring very well amongst the common people. In other words, there was still no Bible to rival the very popular, yet controversial and anti-Roman Catholic, Geneva Bible. This was the primary motivation behind the desire for yet another edition of the Holy Bible. The English religious authorities simply wanted a Bible which would be politically correct, non-offensive to King James, and which would not expose the glaring sins of the Roman Catholic Church. It is a known fact that King James did not like the Geneva Bible for both political and religious reasons. In fact, he said that it was the worst of translations. How much this sounds exactly like the attitude which is now prevalent in our modern, liberal society, where the Bible is being translated once again, and God's Holy Word is being seriously tampered with, in order to produce a politically- correct, non-offensive version, which will neutralize some of the Holy Scriptures' most fundamental teachings regarding sexual morality. For more information regarding this issue, please refer to my series "When Sin Is No Longer A Sin". Referred to as the "translation to end all translations", the Authorized King James Version was the result of the combined efforts of about fifty brilliant scholars. This body of men was very educated in the Greek, Hebrew and Aramaic languages. As I noted earlier, they relied heavily upon Tyndale's New Testament, as well as on the Coverdale Bible, the Matthew's Bible, the Great Bible, and the Geneva Bible; and they even used the Catholic Rheims New Testament for comparison. In addition to this, and perhaps even more importantly, they had access to the Textus Receptus, which is still available to scholars and translators today. Please note that this was Erasmus' original Textus Receptus, and not the fake, corrupt one which is said to have surfaced later. The accuracy of the Textus Receptus was also confirmed by the Majority Text. It is also worthy of note that this body of AKJV scholars did not rely upon any of the documents which form a part of the Alexandrian Text, which they believed were invented by the Roman Catholic Church. This includes the Textus Vaticanus, which was discovered in 1481 in the Vatican Library. 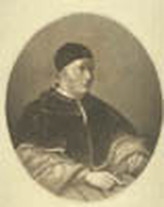 While the Textus Vaticanus was known to Erasmus, it was not used in his compilation of the Textus Receptus in 1516 due to his suspicions about the same. Another questionable text which has been rejected by some scholars, is the Textus Sinaiticus; which was found in 1844 at Saint Catherine's Monastery in a trash heap. The Sinaiticus contains many omissions, as well as many marked out and rewritten words and phrases. Sadly, the modern Roman Catholic Bible is derived from both the Textus Vaticanus, as well as the Textus Sinaiticus, which casts serious doubt upon its accuracy. To continue; for the first two years, from 1605 to 1606, this group of scholars -- among whom is believed to have numbered William Shakespeare -- engaged in private research; and then from 1607 to 1609, they assembled their work. A year later, in 1610, it went to press; and the year 1611 saw the first publication of the official King James Bible. Similar to the Great Bible, this massive tome was sixteen inches in height, and was made available to all Church of England pulpits. It took many years for it to overtake the Geneva Bible in popularity, but eventually, the King James Version not only became the official Bible of the English people, but it also became the most printed book in the history of the world. In fact, for around two hundred and fifty years, the Authorized King James Version remained unrivaled, until the appearance of the Revised Version in 1881. While the very first Bible to be printed in the United States of America was done by John Eliot in 1663 and was in the Algonquin Indian language, the first English language Bible to be printed was the King James Version. That was by Robert Aitken in 1782. In 1791, Isaac Collins vastly improved upon the quality and size of the typesetting of American Bibles, and produced the first "Family Bible", which likewise utilized the Authorized King James Version. That same year, Isaiah Thomas published the first Illustrated Bible in America as well. It too was the King James Version. As an interesting side note to this story of the history of the AKJV, due to a typographical error in Ruth 3:15, in which the pronoun "She" was erroneously rendered as "He", some of the first editions of the 1611 AKJV acquired the name of "He" Bibles, while others were referred to as "She" Bibles. Before concluding this article, allow me to make a few more comments. As I point out in other articles such as "The Lamb Of God Was A Goat", and "My God Is A Shocker", while I fully recognize that the AKJV Bible is a work of the inspiration of God's Spirit, given the political and spiritual environment surrounding the court of King James I during the early seventeenth century, it would be foolish of me, or of any of us, to deny that there were political and religious forces which influenced its translation. So, while I view the AKJV Bible as an inspired work, so much so that it is the only Bible which I personally trust, I must still recognize the fact that the dedicated men who translated it into our English tongue, were just as human as you or I. In other words, they were not perfect; and by virtue of their imperfection, the AKJV Bible cannot be perfect either. Every single word is not "Thus saith the Lord", despite what some die-hard AKJV users might wish to claim. To verify this point, I encourage you to read what the 1611 translators had to say for themselves regarding their own work. In the original AKJV Bibles, following the "Epistle Dedicatory", that is, the dedication to King James I, there is another lengthy section entitled "From The Translators To The Reader", which is a detailed explanation of how those men went about their work. By reading it, we get a glimpse into the minds and hearts of the translators. You will find this document on our web site, in the "Non-EPN Articles" area of our website, under the "Authorized King James Version - AKJV - Of The Bible" section. Knowing human nature, it is difficult for me to accept that the translators were so in tune to the Lord, and so yielded to His Spirit, that they got every single word right. While some people may consider my position somewhat heretical, I prefer to think that I am being a realist. It is my view, that given the puritanical spirit which was prevalent in England during that time, and considering the desire of the translators to produce a version which would be acceptable to the king, that we should suspect that at least a few words were intentionally toned down during the translation process. One example of this, is the word "ebed". This Hebrew word means "slave", and is equivalent to the Greek word "doulos" in the New Testament. Now, despite their clear meaning in the Hebrew and Greek lexicons, the actual word "slave" is found only one time in the entire Old Testament, and nowhere in the New Testament; and the one time that it is found in the Old Testament -- in Jeremiah 2:14 -- it is in italics, in order to show that it was added by the English translators, as a clarification of the sentence. All of the other times that "ebed" and "doulos" are used -- and they number in the hundreds -- they are translated as either bondman, bondmaid, or servant. Why is this? Might it have something to do with the fact that England was heavily involved in slave trade, and so using the correct word "slave" might have been a bit offensive to King James? In other words, "We all know that we practice slavery, but let's use a softer, more polite word in our translation, in order to not offend the king". Allow me to reiterate that in spite of the few verses where I have found what I personally view as possible discrepancies in the translation, I still trust the AKJV much more than any other English Bible which has been published from then until now. To strengthen my position, consider also the fact that, according to what I have read, any authentic parchments or scrolls which have been discovered since the time that the AKJV was translated, have only served to verify the accuracy of the same; they have not detracted from it. As I point out in my companion series, "In Defense Of The KJV", perhaps one of the key factors which influences me to trust in the AKJV, is that more than in any other modern translation, I sense the Power of God in the AKJV Bible. It speaks out to me like no other version does. The others are dry and spiritless by comparison. The AKJV moves me, and it excites me when I read it. Not only does it inspire my faith, but apparently it has done the same for many others as well, because millions of souls have been won to Christ through the use of the AKJV over the past four centuries; and that says a lot! It is tried and proven! There is another very important reason why I have confidence in the AKJV Bible. It has to do with the price. No, I am not referring to its commercial value, but rather to the price in persecution, blood and martyrdom, which had to be paid in order for me to hold a copy of the AKJV in my hands today. No other modern version of the English Bible can make this very same claim; only the AKJV and earlier versions can. From the persecution of John Wycliffe and the evil desecration of his grave, to the persecution, torture and martyrdom of William Tyndale and the sixteenth century Reformers, a steep price was paid indeed; and that should say something about what calibre of men they were, as well as about the calibre of the Bible they have all given us. By comparison, today's modern translations are based upon mere whim, and sadly, upon the financial considerations of huge publishing houses which I do not believe have the same fear of God, or respect for His Word, as those men of old. They will change a word here, or change a phrase there, if it suits their convenience, and allows for higher sales. As I noted earlier, it has gotten so bad now, that they are even altering verses which condemn the ungodly practices of homosexuality and lesbianism, in order that God's Word won't be so offensive to those who indulge in such unhealthy and sinful practices. This is spiritual compromise at its worst. In spite of the AKJV's proven track record, it still has its critics. Principle among them are those who claim that the language of the AKJV has become outdated. They insist that Elizabethan English is simply too difficult for the modern reader to understand. One person who wrote to me some time ago really took this position to the extreme when he stated that Elizabethan English is like a foreign language. I find such a thought to be absolutely ludicrous. My argument is simple: If a young English-speaking person can go to school, and over a period of a few years, learn a foreign language such as Spanish, French, German or Italian, which, by the way, has completely different sentence structure, then in my mind, they should have no difficulty in understanding a form of English which is only a variation of his own English. In light of this fact, I have to view the "Elizabethan English is too difficult" argument as being rather baseless. Furthermore, rather than create yet another translation which might stray even further from the meaning and intent of the original authors, that is, the holy men and prophets of old, is it not a much safer practice to simply allow the reader to use the Hebrew and Greek lexicons, when he or she is in doubt, and trust God's Holy Spirit to rightly lead that person in their understanding of the Holy Scriptures? That is precisely what I do with my Online Bible program, which includes both of the lexicons. I simply fail to see why others cannot do the same as I do, instead of having to rely upon some publishing company doing another translation, in which they basically tell the reader what God's Word is supposed to mean, instead of letting them determine that for themselves through personal diligence and study. It is not the duty or responsibility of these companies to do this for us. Their considerations are financial first, and not the spiritual well-being of the flocks of God. To add weight to my argument, consider the fact that I have read commentaries which state that when compared with some of the more modern versions, the AKJV scores considerably higher in scholastic reading and grammar tests. In fact, if I recall correctly, it is at the fifth grade reading level. In other words, a fifth grade American student can easily read the AKJV Bible, and grasp most of its meaning, if he applies himself to the task. For those of you who may wish to refute my previous remark, allow me to share with you the example of my own daughter. At the time that I authored the original version of this article, she was a normal child of middle school age. In a scholastic sense, she was above average in some areas, but by no means exceptional. She could easily be the child next door. Since her elementary school years, she has been reading the AKJV Bible, and she understands a great deal of it. In fact, she knows some of its stories and Parables better than I do; and she has memorized a number of verses as well. In addition to this, at that age, my daughter knew how to use the Hebrew and Greek lexicons in order to find the original meaning of words and phrases in the Bible, and she had already written several Bible-based articles herself. I do not say any of this to boast, but merely to make a point, and that is this: If this precious child of the Lord can take the initiative and accomplish so much, because she hungers for the full truth of God's Word, why can't some of you who criticize the AKJV, do the very same thing? Surely you possess as much intelligence as my daughter. Or is it that your criticisms of the AKJV are motivated by something else? With these thoughts, I am going to bring this article to a close. I trust that you have found it interesting and informative, and that it has been a blessing in your life. I also hope that the beloved AKJV has been a blessing in your life as well. Please go to part three below for the conclusion of this series. Images To Accompany "History Of The Authorized King James Bible". Please note that these are all thumbnail images. Click on an image in order to see an enlargement of it. Close the new window after you are done viewing it in order to return here. Image: Oliver Cromwell by Robert Walker. 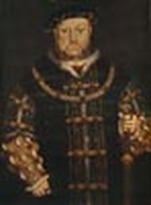 Image: King James the First. Image: King James the First and Guy Fawkes. Image: A page from Tyndale’s Bible. Image: The front of Coverdale’s Bible. Image: The front of the Great Bible. Image: The front of the Geneva Bible. Image: The front of the Bishops’ Bible. Image: The front of the King James Bible of 1611. Image: A page from the King James Bible of 1611. Image: The front of the King James Bible (Cambridge) of 1629. Image: The title of the New Testament King James Bible of 1762. Image: The title of the King James Bible of 1769. Image: Redmond Barry statue holding book.